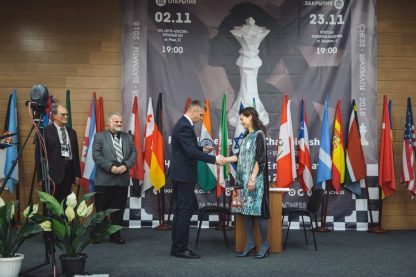 The tie-break between Kateryna Lagno (Russia) and Mariya Muzychuk (Ukraine) ended in favor of the Russian, who won the match 3-1. 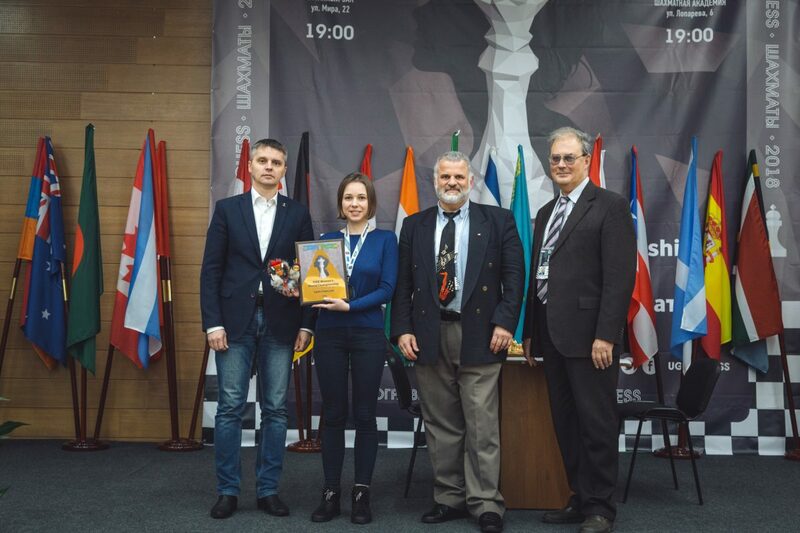 Yesterday Alexandra Kosteniuk (Russia) lost to the defending champion Ju Wenjun (China). 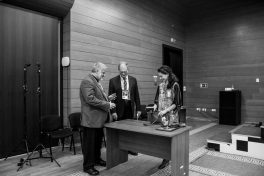 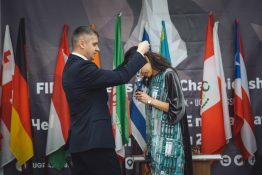 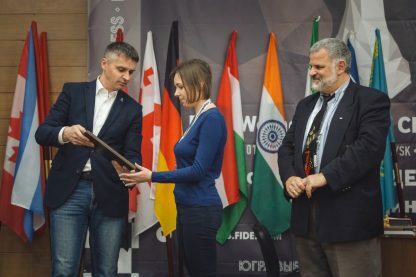 Thus, Kosteniuk and Muzychuk received the bronze medals of the Women’s World Championship. 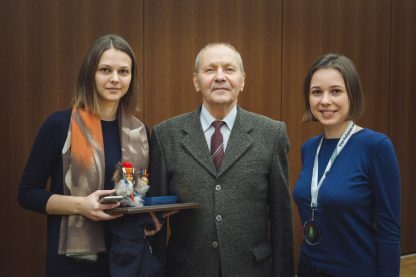 The medals were presented to to them by Sergey Artamonov, director of the Ugra Department of Physical Culture and Sport. 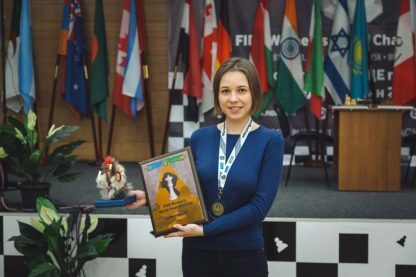 The 12th World Champion Alexandra Kosteniuk (2543) and the 15th World Champion Mariya Muzychuk (2545) were among the rating favorites of the Championship. 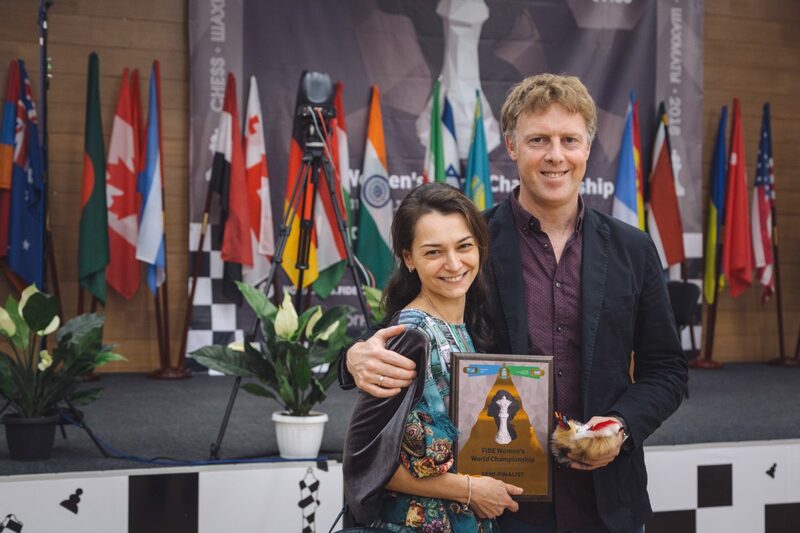 On the way to the Semi-final, Kosteniuk defeated Daniza Vasquez Maccarini (Puerto Rico), Ni Shiqun (China), Harika Dronavalli (India), and Anna Muzychuk (Ukraine). 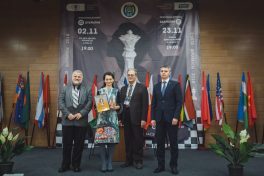 Mariya Muzychuk eliminated Shahenda Wafa (Egypt), Ekaterina Atalik (Turkey), Mobina Alinasab (Iran), and Zhansaya Abdumalik (Kazakhstan). 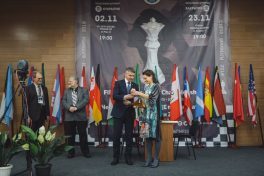 The final match of the Championship will be played on November 19-23 between Ju Wenjun and Kateryna Lagno. 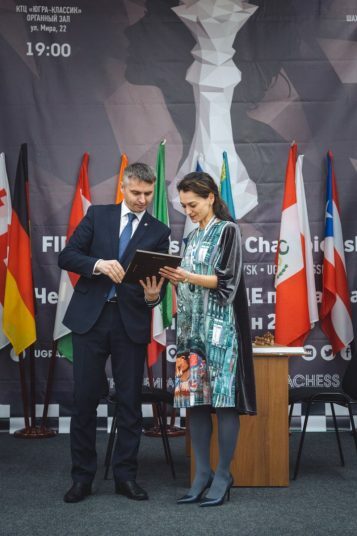 We remind you that according to the recently updated Regulations of the 2018 Women’s World Championship, all the semi-finalists except the eventual champion qualify for the 2019 Women’s Candidates Tournament.